Unified Sports is a program that combines approximately equal number of Special Olympics athletes with athletes without intellectual disabilities (partners) on sports teams for training and competition. Age and ability of athletes and partners is specifically defined on a sport by sport basis. Unified Sports is an important program because it expands sports opportunities for athletes and partners seeking new challenges. In addition, Unified Sports dramatically increases inclusion in the community be helping to break down barriers that have historically kept people with and without intellectual disabilities. Public Education – Unified Sports increases public awareness of the spirit, skills, and abilities of individuals with intellectual disabilities. 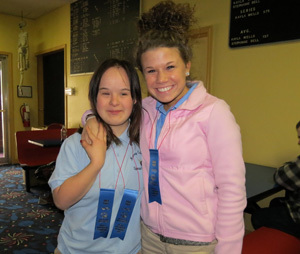 Family Involvement – Siblings of Special Olympics athletes are provided a valuable opportunity to participate as partners or coaches. Personal Development – Team members tend to improve their self-esteem, develop friendships, and gain an understanding of each other’s capabilities through a spirit of equality and team unity. For more information or to become a Unified Partner contact Justin Harville at 800-633-7403 or jharville@soky.org.